Granny also tries to convince Pinky of her responsibilities to her community. This is one of the few popular films that acknowledges and represents a black community (in Imitation of Life, Annie alludes to one but the audience is never allowed to see it, Lost Boundaries is another passing film that depicts both black and white communities). 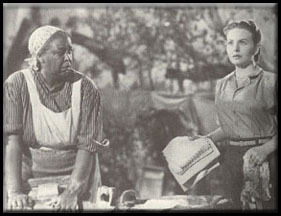 Pinky, who by this point in the film has lived as white for quite a few years, feels conflicted about this community and though she decides to serve the black community at the end of the film, there are many moments before the end when she decides to leave her home because she had become used to "being treated like a human being". 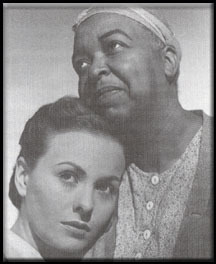 Like the other popular passing films, one of the most important relationships in this film is between two women, white and black. 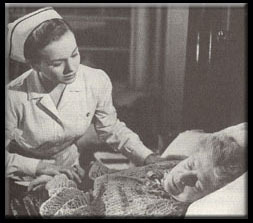 As a way of repaying her grandmother's debt to an old "friend" who nursed her through sickness (and also employed her as a domestic servant), Pinky nurses Miss Em. Miss Em (Ethel Barrymore) is a cranky, wealthy, old woman who used to throw all of the black children off of her property. He relationship with Pinky is one of the most interesting interracial relationships in a passing film. In Imitation of Life and Showboat, the passing characters worked for the white women they befriended. The working relationships were not traditional but the power dynamic was present. In Pinky, Pinky has the right to leave Miss Em whenever she chooses and demonstrates her annoyance at the power games played by the old woman (in a pathetic attempt to maintain racial and power relationships). Up to this point, Miss Em is the only white character to engage in a full discussion about passing in film. However, like the black characters, Miss Em has conflicting emotions about Pinky. In the end, through her will, she decides to reward Pinky (and Granny) by giving Pinky her home. Pinky is forced to make a decision that will change her life: to return to her old life with Tom (her boyfriend), or to stay in the black/"her" community. Tom, the understanding, and naiive boyfriend, begs ther to join him and complains that he does not understand her commitment to "these" people. It is not clear that Pinky really understands this commitment either, and like other passing characters, she mentions her people without really ever demonstrating a connection to that community. In the end of the film, Pinky decides to sacrifice her own happiness to stay with "her people" and use Miss Em's house to start a nurses teaching hospital. 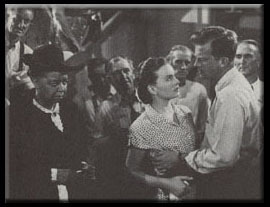 This ending places the character Pinky in the company of all other passing characters in films, as the tragic mulatta. Despite the new social consciousness demonstrated in many other parts of the film, Pinky uses many of the same storylines and visual images as other passing films: violence against the passing figure, generational conflict, undying loyalty to white people, strife between blacks because of skin color, emphasis on traditional communities and rejection of cities, and education as a tool to escape blackness.